Families choosingcremation may also have a casket viewing, funeral service and a burial. Manyfind this traditional format of final arrangements provides them with a senseof comfort. The funeral directors of Scarpa-Las Rosas Funeral Home offer rentalcasket and cremation casket choices. They make their peaceful facilitiesavailable for a visitation, viewing or wake. If desired, families may choose tohave this service held at a cremation chapel or at a place of religiousworship. After the funeral, the loved one is taken to a crematorium. After thecremation process is concluded, our staff can arrange for a private or publicservice for the final disposition of the cremated remains. Funerals serve manyimportant functions. They allow the living to pay their respects to thedeparted and to offer condolences to the family left behind. They are agathering place for mourners to assemble in order to share memories of thedeceased and reflect upon his or her life and accomplishments. Funerals honorthe relationships that the loved one had with family and friends. They are away for survivors to acknowledge the finality of death. A funeral service providesan environment in which to those close to the deceased may find comfort andsupport. Most importantly, as agreed about by all grief experts, funerals arean essential component of the healing process. 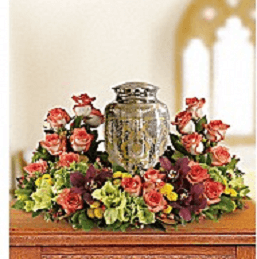 The funeral directors ofScarpa-Las Rosas Funeral Home will provide you with a fitting and meaningfultribute to your loved one. We design personalized funeral services thatcapture the spirit and individuality of your deceased. We can also arrangefor a viewing to precede the funeral, and this can feature either an open orclosed casket. Our professional staff will assist you in selecting a rental or cremation casketthat is suitable to your tastes and budget. After the cremation, our funeral director can plan for a service dedicated to the final placement of the cremains.